The Wide Sturdy Sliding Gate helps you keep your curious crawler in the child-friendly areas of your home, but makes it easy for you to travel from room to room. The sturdy frame of the gate expands from 40 to 60 inches for coverage between extra-wide openings and provides a full 26.5 inches of height protection. Because parents often have their hands full, this gate is designed to open easily with one hand: just press and slide the easy grip handle to open. It also gives you options, With a pass-through slide open or a swing open option, the Wide Sturdy Sliding Gate lets you choose what works best for your family. EXTRA WIDE FOR LARGE DOORWAYS: This safety gate fits spaces between 40" and 64" wide and is 26.5" high. Great for fencing off rooms used less-frequently. SECURE AND STURDY: Solid hardware mount - this gate requires drilling holes into the wall to provide maximum security. 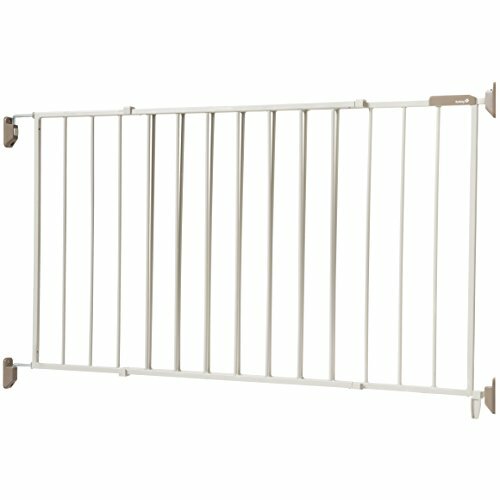 PERFECT FOR BABIES OR PETS: This gate is meant for use within the home; at the bottom of stairs, hallways and doorways. TWO PANEL DESIGN: Designed for use by adults to walk through either by sliding or swinging the door to open. ONE HAND RELEASE: Adults can use the easy-grip handle to press and slide the latch in order to access the gated off area.